Our Social eMotions project combines science and art, also in that the outcomes are both scientific and artistic. The science part is taking shape, we are writing up a paper on the kinematic analysis, as well as the perceptual experiments. At the same time, the artistic oven has been red hot, as the dance performance has been taking shape. Our amazing dancers and musicians worked very hard during the first weeks of June to put together this ambitious and novel performance. There is choreographed movement and composed musical material, but the performance is improvised in the sense that the emotional dynamics and emotional contagion will change and mutate the materials. There is a very interesting set of interactions going on, as both dancers influence each other, as do both cellists, and of course the dancers are influenced by the music, and vice versa. To keep things even more open, the audience will get to vote for the emotions that the performers work on. The audience gets this chance a few times during the performance, and as the full cycle will be performed twice, they can make different choices and thus experiment on emotional processes, using live dancers and musicians! We already trialled this in an open rehearsal during the Helsinki Day, as a part of “Planet Suvilahti“. As the pic shows, there were a lot of people attending, and we got really nice feedback! Communicating the results of the online vote to performers was done in an old-fashioned way by showing the emotions on pieces of paper. By the actual performance, we’ll figure out a smoother way of doing it, hopefully integrating them to the interactive projections. There is now also a trailer of the performance, it can be viewed below. The next public showcase of the work will be presented in Duesseldorf during the Tanzmesse on 2nd September, and the premiere will take place in Oulu on the final day of the OuDance Festival (Sunday 18th September). That performance will (weather permitting) be outdoors on the Rotuaari promenade. See you there? Social eMotions trailer from Jarkko Lehmus on Vimeo. As I unfortunately (or, as the reason is a newborn baby in the family, fortunately) were not able to attend the ICMPC14, I decided to summarise our study (co-authored with Maija Niinisalo and Riitta Hari, a poster was supposed to appear at the Music & Movement 3 session on Thursday, 4:00 pm, Seacliff A-C, Th23) on dyadic improvisation in this blog post. The blog post format allows me to use videos etc. to illustrate the tasks and the data better than a static poster would, and also lets me write a bit more about it than would fit in a poster. If you have any questions, drop me an email. We are currently writing this up as a journal article, so you’ll get the whole story soon, I hope. We studied kinematics and coordination in a mirror game using fluent, improvised movements (circle drawing & free movement). 32 participants took part in dyads. In turn, one of the participants was appointed the leader, or the dyad was instructed to share leadership. Hand movements were recorded with optical motion capture. Compared to the leader–follower condition, sharing leadership resulted in more synchronous circles, smoother free movements, and stronger mutual adaptation. As I mentioned in the earlier post from the International Symposium on Performance Science, string quartets seem to be fashionable in music psychology, and for good reasons. They are perhaps the prototype of a chamber music ensemble, with lots of great pieces written for them, they are of an optimal size for such studies, and of course there are many professional quartets that have worked together for years, making them extremely interesting topics for research on coordination and interaction. A new study from Genoa looks at communication in a string quartet, using a cool setup. The traditional view of cognition is that brains are responsible for information processing, and to study that brain and how it works should be done by metaphorically evacuating it from the skull, bolting it on the test bench of the psychology lab and put it through its paces. As an analogy, you can’t get a comprehensive idea of the performance of the car based on just having its engine being measured in a test bench. You will learn nothing about how the car will handle under different conditions, how comfortable or handy it will be etc. I don’t want to push that analogy any further, as I think it’s already as far as it uncomfortably goes, but cognitive psychology is well-known for leaving out the (usually) social context in which the individual mind works, and also the body in which it resides, which it moves and which takes it to places. While fields like social and cognition and cultural psychology have tried to bring in the social side of our being, embodied cognition is the keyword for studying how the mind and body work together to instantiate behaviours and cognitive processes. Music is a great domain to study these issues, and one could argue that in order to study music, one needs to take both the social and embodied contexts into account. 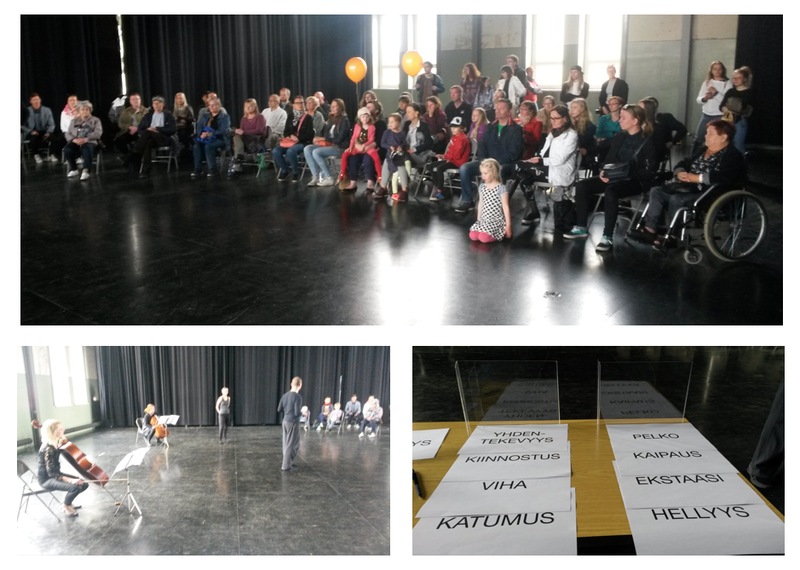 In Jyväskylä, we study music-related movement with this in mind; to understand what takes place when someone plays music, we need to see how they use their bodies AND how they use their minds. That’s a bit of an intro to this interesting paper I recently found. In the paper “Moving Through Time”, the authors from the University of Aberdeen discuss their study, where they tracked the forward-and-back -movement or posture of people who were either recalling their past or predicting what their future would look like. They noticed that when imagining their future (the ability to travel subjectively through time, is called chronesthesia, in case you need to impress someone, or for instance come up with a fancy-sounding excuse for staring blankly ahead) people would be leaning forward, and when recalling the past, they’d be leaning backward. According to the authors, this demonstrates that this subjective time travel has an observable behavioural correlate and that this is an instance of how the perception-action cycle works. This is a very clear and simple study, and the results look very clean. I wonder if we could somehow extend this to interpersonal or musical contexts… Please leave a comment if you have ideas!